Arthur “Art” William Landgren died peacefully at home on February 9, 2017 in Port Byron, IL at the age of 70. Art was born November 17, 1946 in Joliet, IL to Clara (Ptaszynski) and Arthur William Landgren Sr, and he was raised in Lemont, IL. He served in the Army in Vietnam. 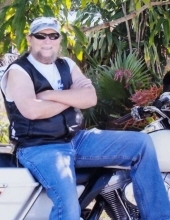 Art worked for Mack Truck in Bettendorf, IA for 21 years and was a master mechanic. Most recently he was an associate of Big River Custom in Port Byron, IL. A dog magnet, Art often collected strays and always had a canine companion. He was a great friend, always there to give a helping hand. Art loved to travel and had friends across the country. He was happiest on a motorcycle with the wind in his beard. Art is survived by his children Sue (Paul) Milburn of Prophetstown, IL, Rachel Hart of Davenport, IA, Lesley (Corey) Coussens of Bettendorf, IA, his brother Robert Landgren of Lemont, IL, and his sister Faye (Louis) Voltarel of Fort Myers, FL. He also leaves behind grandchildren Max, Sydney, and Riley. To plant a tree in memory of Arthur Landgren, please visit our Tribute Store. "Email Address" would like to share the life celebration of Arthur Landgren. Click on the "link" to go to share a favorite memory or leave a condolence message for the family.